I’m all for a great lipstick and colour but have found that most lip glosses are too glossy and sticky for my taste. 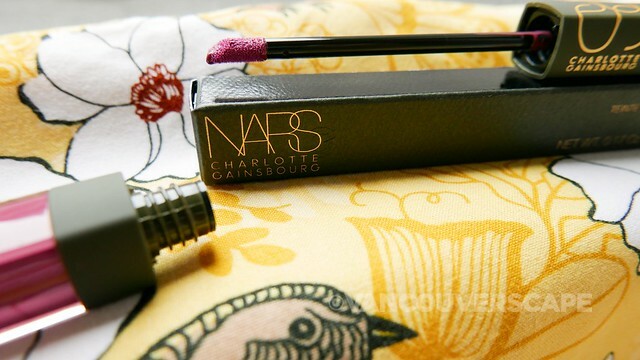 I was therefore pretty excited to stumble upon the recent NARS collaboration with French chanteuse Charlotte Gainsbourg, part of a limited-edition collection of makeup launched this spring. The singer and cosmetic founder met during a New York photo shoot. As Charlotte is a NARS fan (and likewise François Nars a fan of her music), the duo naturally clicked and decided to work together on a product range. According to Nars, “Her allure is all in the uncompromising power of her personal style … very cool and authentic, very French.” The resulting collection defines just that. For those of you who don’t know Charlotte, the British-French actress and singer’s created a catalogue of sultry, soothing songs over the years, making her musical debut at the tender age 12 with her father, renowned singer/songwriter Serge Gainsbourg, considered a key player in French pop music as well as the creator of a diverse musical catalogue during his time. Though I’m only moderately familiar with her films (I’m Not There, Melancholia, The Science of Sleep, 21 Grams and others) as I am with her third album, IRM (recorded at Beck’s Los Angeles home studio no less! ), this collaboration celebrates the multi-faceted artiste and her many charms. The entire range been inspired by Charlotte’s intimate experience with makeup on set, with memories of London and music in Paris evoking lived-in colours and textures throughout the line. The lip tints – offered in three shades – add natural colour to your lips and wear comfortably. They’re packaged in brown-capped tubes with a gold NARS logo and Charlotte Gainsbourg written on one side in all caps. The product offers a little gloss with moisture-retaining coconut oil plus vitamins C and E to help hydrate and protect your lips. It’s easy to apply using the built-in wand; the colour lasts awhile, later leaving a more natural shade behind. I was sent the lip tint in Éphélide (French for freckles), a medium-rose shade. Double Decker (ruby red) and Promise (red plum) complete the trio.